"CMYK" redirects here. For the extended play by James Blake, see CMYK (EP). "CMYB" redirects here. For the cMyb gene, see MYB (gene). Color printing typically uses ink of four colors: cyan, magenta, yellow, and black. When CMY “primaries” are combined at full strength, the resulting “secondary” mixtures are red, green, and blue. Mixing all three gives an imperfect black or a perfect grey. What appears as cerulean ( ) in the top image is actually a blend of cyan, magenta, yellow and black, as magnification under a microscope demonstrates. This diagram shows three examples of color halftoning with CMYK separations, as well as the combined halftone pattern and how the human eye would observe the combined halftone pattern from a sufficient distance. With CMYK printing, halftoning (also called screening) allows for less than full saturation of the primary colors; tiny dots of each primary color are printed in a pattern small enough that humans perceive a solid color. Magenta printed with a 20% halftone, for example, produces a pink color, because the eye perceives the tiny magenta dots on the large white paper as lighter and less saturated than the color of pure magenta ink. Without halftoning, the three primary process colors could be printed only as solid blocks of color, and therefore could produce only seven colors: the three primaries themselves, plus three secondary colors produced by layering two of the primaries: cyan and yellow produce green, cyan and magenta produce blue, yellow and magenta produce red (these subtractive secondary colors correspond roughly to the additive primary colors), plus layering all three of them resulting in black. With halftoning, a full continuous range of colors can be produced. The same image, this time separated with maximum black, to minimize colored-inks use. In traditional preparation of color separations, a red keyline on the black line art marked the outline of solid or tint color areas. In some cases a black keyline was used when it served as both a color indicator and an outline to be printed in black. Because usually the black plate contained the keyline, the K in CMYK represents the keyline or black plate, also sometimes called the key plate. Text is typically printed in black and includes fine detail (such as serifs), so to reproduce text or other finely detailed outlines, without slight blurring, using three inks would require impractically accurate registration. A combination of 100% cyan, magenta, and yellow inks soaks the paper with ink, making it slower to dry, causing bleeding, or (especially on cheap paper such as newsprint) weakening the paper so much that it tears. Although a combination of 100% cyan, magenta, and yellow inks should, in theory, completely absorb the entire visible spectrum of light and produce a perfect black, practical inks fall short of their ideal characteristics and the result is actually a dark muddy color that does not quite appear black. Adding black ink absorbs more light and yields much better blacks. Using black ink is less expensive than using the corresponding amounts of colored inks. When a very dark area is desirable, a colored or gray CMY "bedding" is applied first, then a full black layer is applied on top, making a rich, deep black; this is called rich black. A black made with just CMY inks is sometimes called a composite black. The amount of black to use to replace amounts of the other ink is variable, and the choice depends on the technology, paper and ink in use. Processes called under color removal, under color addition, and gray component replacement are used to decide on the final mix; different CMYK recipes will be used depending on the printing task. CMYK or process color printing is contrasted with spot color printing, in which specific colored inks are used to generate the colors appearing on paper. Some printing presses are capable of printing with both four-color process inks and additional spot color inks at the same time. High-quality printed materials, such as marketing brochures and books, often include photographs requiring process-color printing, other graphic effects requiring spot colors (such as metallic inks), and finishes such as varnish, which enhances the glossy appearance of the printed piece. CMYK are the process printers which often have a relatively small color gamut. Processes such as Pantone's proprietary six-color (CMYKOG) Hexachrome considerably expand the gamut. Light, saturated colors often cannot be created with CMYK, and light colors in general may make visible the halftone pattern. Using a CcMmYK process, with the addition of light cyan and magenta inks to CMYK, can solve these problems, and such a process is used by many inkjet printers, including desktop models. 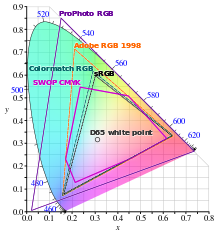 Comparison of some RGB and CMYK color gamut on a CIE 1931 xy chromaticity diagram. Comparisons between RGB displays and CMYK prints can be difficult, since the color reproduction technologies and properties are very different. A computer monitor mixes shades of red, green, and blue light to create color pictures. A CMYK printer instead uses light-absorbing cyan, magenta, and yellow inks, whose colors are mixed using dithering, halftoning, or some other optical technique. Similar to monitors, the inks used in printing produce a color gamut that is "only a subset of the visible spectrum" although both color modes have their own specific ranges. As a result of this, items which are displayed on a computer monitor may not completely match the look of items which are printed if opposite color modes are being combined in both mediums. When designing items to be printed, designers view the colors which they are choosing on an RGB color mode (their computer screen), and it is often difficult to visualize the way in which the color will turn out post-printing because of this. To reproduce color, the CMYK color model codes for absorbing light rather than emitting it (as is assumed by RGB). The 'K' component absorbs all wavelengths and is therefore achromatic. The Cyan, Magenta, and Yellow components are used for color reproduction and they may be viewed as the inverse of RGB. Cyan absorbs Red, Magenta absorbs Green, and Yellow absorbs Blue (-R,-G,-B). Spectrum of the visible wavelengths on printed paper (SCA Graphosilk). Shown is the transition from Red to Yellow. White, red, blue, and green are shown for reference. Readings from a white orchid flower, a rose (red and yellow petals), and a red cyclamen flower are shown for comparison. The units of spectral power are simply raw sensor values (with a linear response at specific wavelengths). Since RGB and CMYK spaces are both device-dependent spaces, there is no simple or general conversion formula that converts between them. Conversions are generally done through color management systems, using color profiles that describe the spaces being converted. Nevertheless, the conversions cannot be exact, particularly where these spaces have different gamuts. The problem of computing a colorimetric estimate of the color that results from printing various combinations of ink has been addressed by many scientists. A general method that has emerged for the case of halftone printing is to treat each tiny overlap of color dots as one of 8 (combinations of CMY) or of 16 (combinations of CMYK) colors, which in this context are known as Neugebauer primaries. The resultant color would be an area-weighted colorimetric combination of these primary colors, except that the Yule–Nielsen effect of scattered light between and within the areas complicates the physics and the analysis; empirical formulas for such analysis have been developed, in terms of detailed dye combination absorption spectra and empirical parameters. ^ McCue, Claudia. Real World Print Production. 2007 Peachpit, Berkeley. p 31. ^ Roger Pring (2000). WWW.Color. Watson–Guptill. ISBN 0-8230-5857-3. ^ R. S. Hodges (2003). The Guild Handbook of Scientific Illustration. John Wiley and Sons. ISBN 0-471-36011-2. ^ Carla Rose (2003). Sams Teach Yourself Adobe Photoshop Elements 2 in 24 Hours. Sams Publishing. ISBN 0-672-32430-X. ^ a b Gaurav Sharma (2003). Digital Color Imaging Handbook. CRC Press. ISBN 0-8493-0900-X. Wikimedia Commons has media related to CMYK.